This trend has many implications, not the least of which are financial. Women used to be viewed, accurately, as part of a household, with women often benefitting from the contributions of a higher-earning husband. These days, women increasingly find that they are on their own financially. Since women typically earn less than men, live longer, and are the primary caretakers of children and elderly parents, this is a difficult challenge. Repeal WEP & GPO! An American widowed woman who teaches in Missouri should not have to retire in poverty! WEP takes half of my earned Social Security and the Government Pension Offset takes all of my survivor benefits! My deceased husband contributed over $90,000 into Social Security plus money into his Medicare account! Where does his money (my survivor benefit) go??? These 2 outdated laws are screwing with women! Isn’t the biggest difference for women between our generation and our parent’s generation due to women’s liberation? Our mothers really had no choice but to stay married. Even those who worked were mostly employed in low skilled jobs and could not afford to live independently with children. Our mothers were not engineers or electricians or business owners. Hurray for Boomer women who changed it all! All that said, I still know Boomer women who chose not to pursue careers until they were forced to by divorce or widowhood. 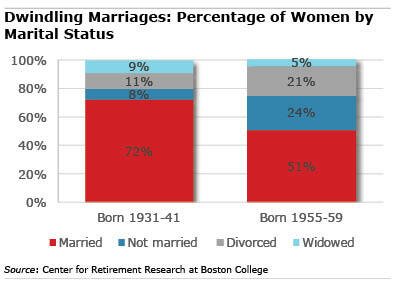 I believe that to be the main reason why Boomer women as a whole are not financially prepared for retirement when they become unmarried seniors. Too many just left the workplace for way too long and didn’t gain the skill-building experience their male colleagues did. The main advice I would give to younger women – actually, that I have given to younger women – is to not count on someone else for your financial security. And, if married, get involved in planning for your financial future and managing your household’s financial assets. This trend very much rings true in my community, or rather in the group of people that I have observed within my circle (work, neighbors, friends, etc.). At least 50% of women that I have met that have married, are divorced (including myself), 2 of my friends whom are physicians, decided that at 40 they would not be able to find anyone and had children on their own via invitro fertilization. Also, in the offices and educational environments that I have been exposed to, overwhelmingly African American women are single with children. Society is more and more inclined to allow more freedom for women to choose a life of their own, rather than being trapped in an unhappy or abusive marriage. Also, the media affects men significantly in that they portray women as objects and as having to fit a perfect image, if that is not the case then the women are not desirable. This leaves many women out of the picture, or men no longer desire women after women reach a mature age. More research needs to be developed in this area, to determine the long term consequences and also to address the pay disparity between men and women. Obama tried without success to pass equal pay laws. I am uncertain as to why women did not stand up “en masse” for the laws to be in effect. Hopefully as more women get into the workforce and we replace men in the higher positions, we can enforce the notion that women should be paid equally as men are.